Blaxploitation movies were all the rage in the 1970s, representing African-Americans on-screen in ways that were somewhat empowering, such as Richard Roundtree’s now-iconic private detective John Shaft, but also controversial for their stereotypical and often less-than-appealing representation. The latter two are what made 1972’s Super Fly, then starring Ron O’Neal in the main role, one of the more divisive entries of the genre; although nowadays it’s celebrated as an essential movie of the period, many were displeased at the time by its glorification of street crime involving mostly black males, including pimping, drug pushing, and casual violence. But I reckon that those people back then would have been a little more annoyed by the 2018 remake Superfly, not because it’s a more questionable portrayal of African-American life, but because it’s so uninteresting and such a dull experience that they’ll feel like their valuable time was wasted a lot more with this film than any other Super Fly project, even its lesser-received sequels. As in the original, the film follows Youngblood Priest (Trevor Jackson), a streetwise cocaine dealer in Atlanta who seeks to escape his criminal life for good, and he attempts to do so by putting a drug-dealing scheme in motion that will leave him with enough money to leave the city. However, his scheme comes under fire from several forces, including a rival gang known as the Snow Patrol, a couple of corrupt cops – one of them being Once Upon A Time’s Jennifer Morrison – a deadly Mexican cartel, a betrayed supplier who was also Priest’s former mentor (Michael K. Williams), and an irate Snow Patrol member called Juju (Kaalan “KR” Walker) who hates Priest so much that he just wants the guy dead at any cost. The reason why films like Super Fly, Shaft, Sweet Sweetback’s Baadasssss Song and others became as popular and beloved as they did was because they were stylish, smooth and unapologetically cool movies that, no matter what you think about how well they represent African-American life, always made the audience feel excited by how awesome and memorable most of these characters were. There is none of that present in this movie, which looks and feels like a soulless music video – and given that it’s directed by someone who primarily makes music videos, a guy by the name of Director X, that should not be surprising – that never springs to life in any interesting or attention-grabbing way. Though there is certainly violence and strong language, the movie still finds a way to play things conservatively safe, making itself up of a lot of crime movie tropes you’ve seen countless times before, with characters that you don’t really care all that much about, and a plot that just drones on and on, more than overstaying its welcome by at least half an hour (seriously, I thought the movie was about done with after what feels like a climactic scene, only to find that it just kept going, and going, and going until I realised that there was no end in sight). There is nothing you can latch on to, not the story, not the style, and certainly not this incredibly dull lead performance. I’ll give Trevor Jackson some slack in that he was at least trying to do something different to how Ron O’Neal originally portrayed the character, but Ron O’Neal had charisma, charm and screen presence to spare; all of which are things that Jackson sorely lacks, in his very monotonous and boring performance where all his dialogue never feels naturally cool but more like just an actor who’s memorised these lines he read in the script. Because this guy cannot carry this movie to save his life, you’re left wondering why and how this charisma-vacuum of a character ended up becoming such a revered street presence and apparently got so good at it that he’s living in a pretty nice place with two attractive girlfriends. There’s just nothing to this character, or this performance, that really makes you care about whether he manages to make it out of it alive, or anything else; he’s a pretty dull lead that appropriately fits well into this pretty dull movie. Apparently, principal photography on this movie only began January of this year and then wrapped two months later, before being prepped for a June release in the United States; while it’s not uncommon for a movie to be filmed, edited and released all within the same year (though nowadays it is a rarity), the rushed nature of this film greatly shows in how scenes will just go by with an imbalanced pace, with editing that feels like it was all part of a rough cut before being worked into a more coherent final product, and cinematography that simply isn’t given enough time to be stylish or even figure out what it wants to do. It all goes along with how this film largely feels like a cynical studio attempt to cash in on people’s nostalgia for the original movie, because there is no thought put into the style of this film to make it stand out from the others in this series, and the script, direction, acting and cinematography are all so bland and unengaging that you’re not likely to remember anything about this movie in the long term, other than you saw it and it left absolutely no impact on you whatsoever. If you want to watch a much better homage to Blaxploitation cinema, just watch BlacKkKlansman instead; it’s a way more interesting film than the movie that’s actually meant to be a Blaxploitation film. 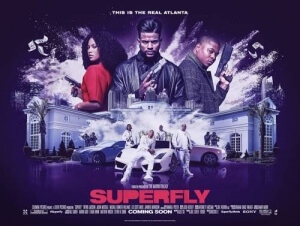 Superfly is a bland and uninteresting remake of the Blaxploitation classic which leaves virtually no impact due to its dull direction, overlong running time, uncharismatic lead performance, and rushed nature of its production.